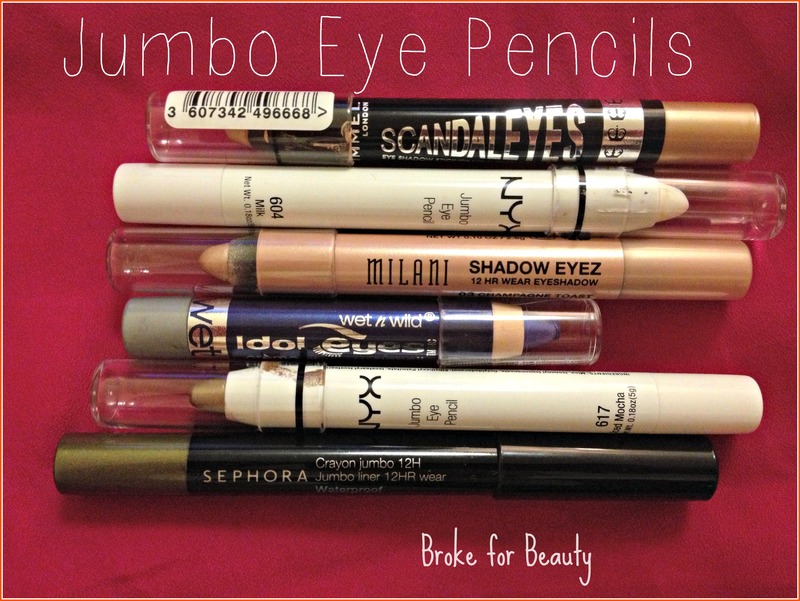 I love using jumbo eye pencils as a base to my eye look because they help keep eyeshadow in place and can really make the colors look brighter or add dimension. I also like having that extra layer of security against creasing. Also, these can make great eyeliners on the top or bottom lash lines for a surprising bit of color! This is a beautiful color, but I mostly just use it as a liner for a nice pop of color. It is very pigmented and lasts quite a while for such a cheap product! I don’t know if I would trust it without a primer underneath over the whole lid, though. 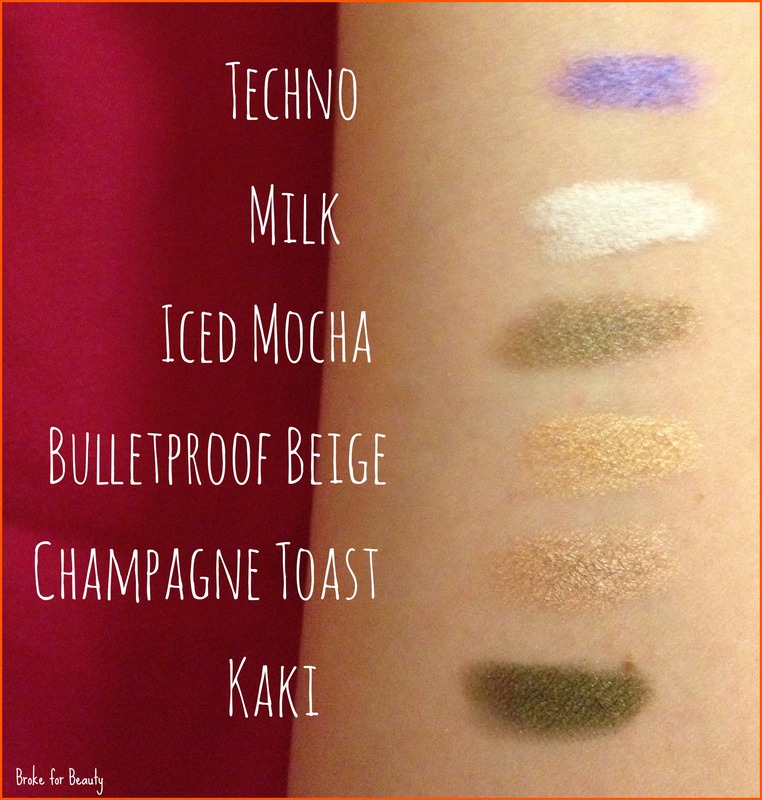 Milk is a wonderful base that makes colored eyeshadows pop. I haven’t had any problems with creasing or fading with a primer underneath, either, so needless to say I’m totally in love with this product! I just purchased Iced Mocha a couple of days ago, but I’ve already worn it once and I’m certainly not disappointed. It’s a great one-eyeshadow look because of the dimension of the tone and shimmer. This is a beautiful gold-champagne that goes really well with neutrals as well as bright colors in the crease. The package says it’s 24 hr/waterproof wear, so while I haven’t tested that, I can say that it does last all day and looks great. My only complaint is that it broke right when I opened it, but once I sharpened it, it was as good as new! I really love this pink-champagne underneath neutral shades, especially from my Naked palette. It’s a similar color to Sin, so it goes well with many of the colors in the palette. I haven’t tested if it really wears for 12 hours, but it does last a long time once it sets. This shade is a little too glittery for the whole lid, but it’s a beautiful liner on the top and bottom lash lines! It looks great with my brown eyes. I can’t wait to use this in the fall! I, again, haven’t tested if it’s truly waterproof, but once it’s set it won’t smudge. It’s a little pricey so I suggest trying it out in a color you’ll wear a lot before springing for brighter colors. As always, thanks for reading! Let me know in the comments if there’s something you’d like to see on an upcoming Sunday Spotlight! Sure thing! Let me know if you try any of these out.